Don’t want to spend a lot of time cutting a video? Do you need to simply cut the video online without installing any specific software on your PC or mobile device? If so, the solution is here. We’ve prepared a list of top 10 free online video cutters you can use directly from your browser, so you can cut any video you want anytime you need. 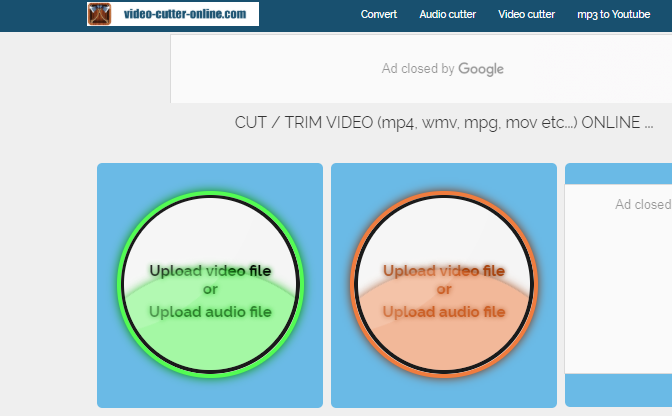 This web service provides you with an online video cutter for free, so it allows you to work with your videos online in three rather simple steps: open file, cut it and save. You can upload a video from your device or Google Drive or just paste a link to a video. There are more options than just cutting and splitting videos online. 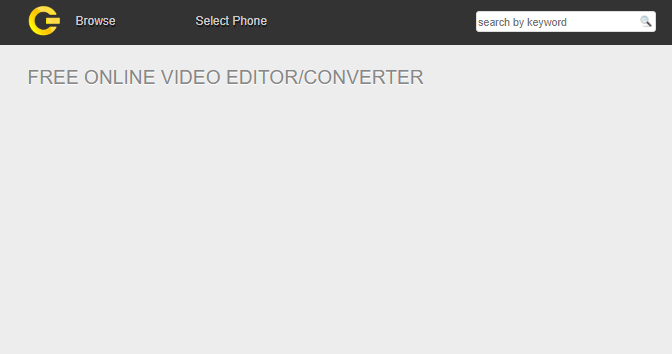 This tool supports almost all video formats so you can use it, for instance, as free MP4 online video splitter as well. However, there's an important drawback as well – file size maximum is limited up to 500 MB only. This is both free online video cutter and splitter. It has filters and transitions as well as titles and backgrounds. And as for basic options, it surely allows you to cut and split video online for free. Moreover, this multifunctional tool lets you adjust colors, apply filters, and much more. After editing a video, you can save it even in HD. 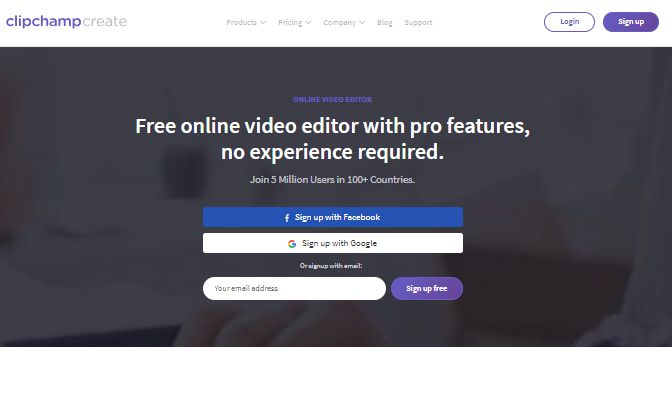 Even so, there is at least one disadvantage – you can work with this free online video editing tool using the latest version of Google Chrome only. This tool mentions itself mainly as a video trimmer. 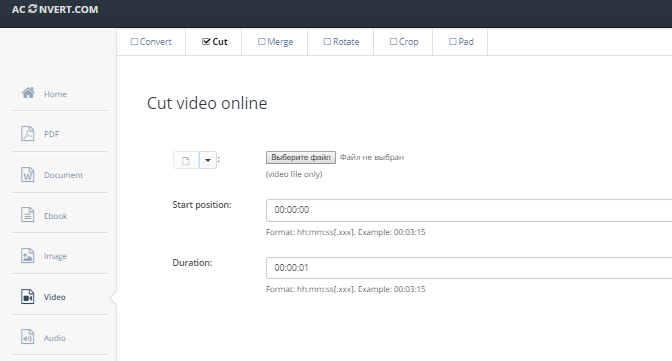 It allows you to edit videos by cutting away any parts of your video and you can cut it to the desired length as well. Also, it provides some basic options, so you can use it as a free MP4 splitter online for instance. The interface is user-friendly and it takes just little time to upload a video. The main disadvantage is 300 MB maximum file size limit for your video, and it can be no longer than 30 minutes. The functionality of this web tool is really simple and best suits for quick editing for short videos. There is the only one thing you can do – it’s cutting videos online. To cut a video, you just need to set start and end points at the wave bar. There is a preview option, so you can see the final result before publishing. Despite its simplicity, this online service is suitable for short videos only, because the maximum file size is limited up to 50 MB. 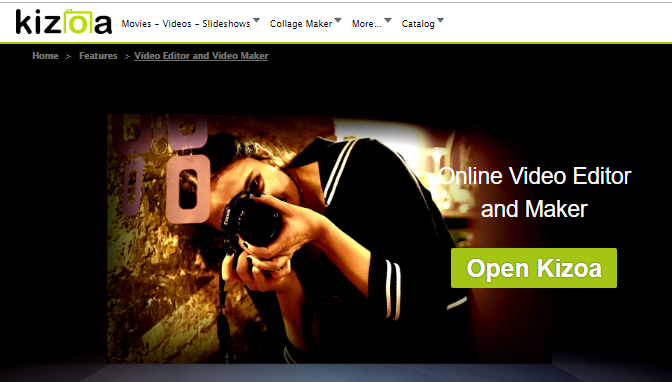 Kizoa is one more web service useful for online video cutting. It has a wide range of functionality including a large variety of video intros and outros. There is overlay music with an unlimited number of songs and sound effects. All in all, Kizoa gives you the ability to make a movie with your photos, videos, and your own music. It is also available for iPhone on the App Store. To reach the perfect sound, you can manually or automatically adjust the music volume as well as the original sound of your video. 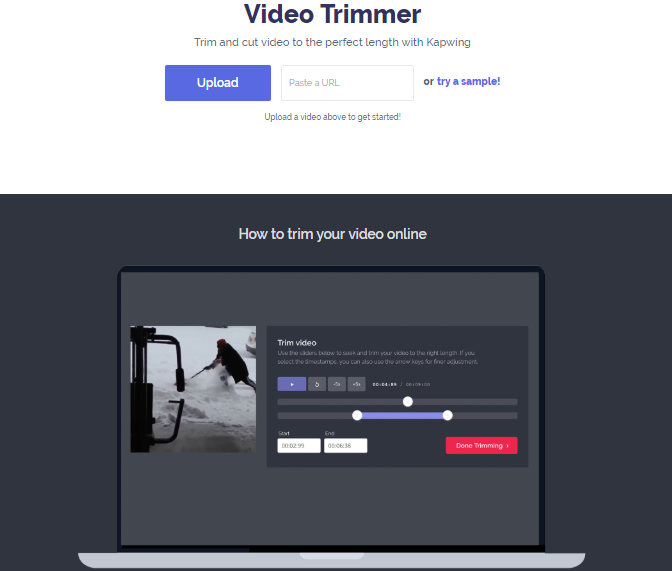 Using this tool allows you to cut video online. Encoding and converting are supported too. All you need to do is set start position for cutting and the desired duration of the video you are working on. You can save the output file to cloud storage such as Google Drive or Dropbox. 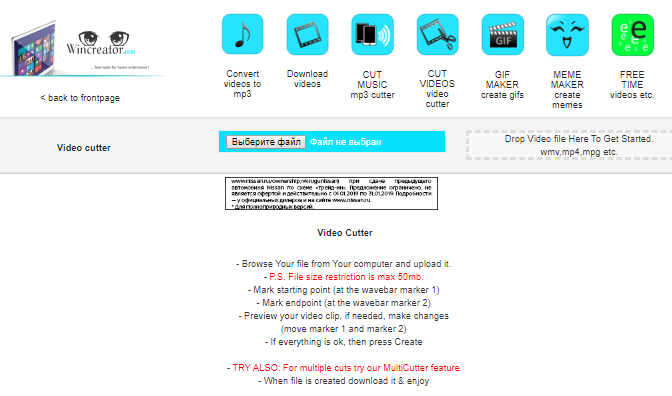 This free video cutter supports all popular formats such as MP4 and OGV. This free online video clipper is best suitable for video cutting and splitting. You can easily upload videos from your device and start editing them in one click. There is also one drawback – you can’t use Google Drive or just paste a link to a video to upload it. This online video editor with really impressive design gives you a lot of opportunities to make your movie perfect. With its large functionality, you can capture, view, create, share, and cut videos. The only yet big disadvantage is that the free online version doesn’t provide you all the features, that’s why you need to buy the commercial version of this video editor to try its functionality at its best. It provides you with a wide range of basic moviemaking features, e.g. cutting and cropping absolutely for free. The upload file size maximum is 1500 MB, so you can create and edit even your own full film. One more great feature is that it can help you to analyze your video files and show all the information about the resolution, codec, frame rate, bit rate and so on right on your display. It supports almost any video format so can be easily used as an MP4 cutter online. 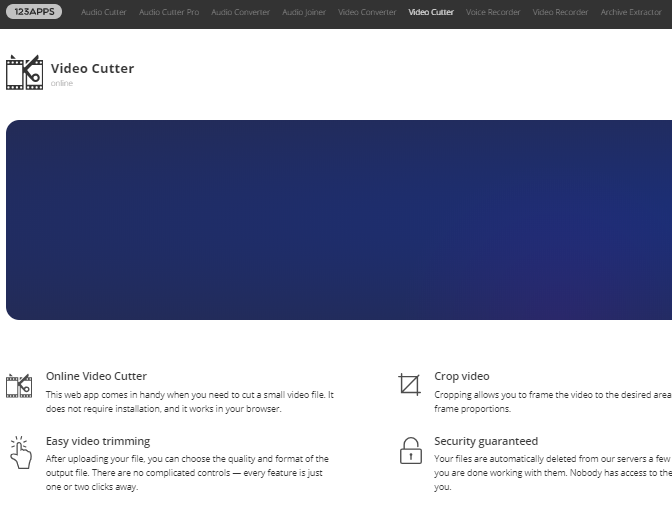 This free video cutter allows you to trim, cut and convert videos online in almost any format you want. 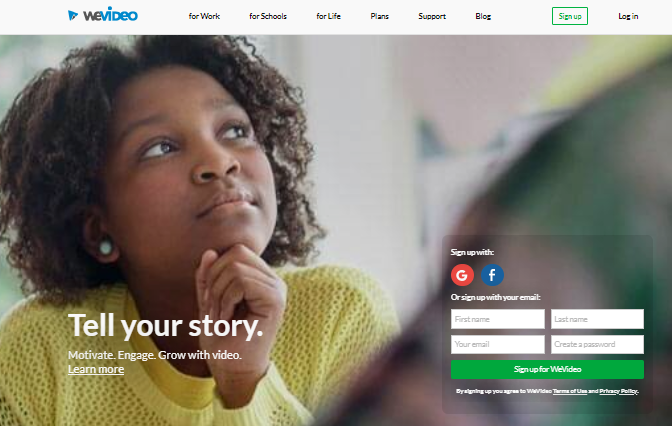 The tool is quite simple: the only you need to do is upload your video from any device or even just paste a link to a video, then set start and end points for cutting and start editing. The great feature of this product is full support of all popular browsers. This service provides its users with a large set of video instructions for working with it. Moreover, this service requires no registration at all. So, all these websites above are perfect for your needs if you are in a hurry, but for more customized and powerful options you can also download and install PC software. 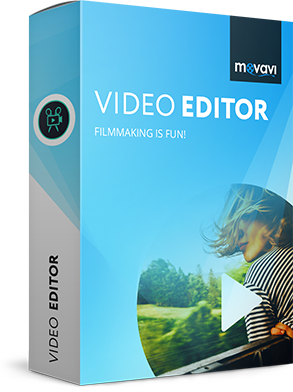 One of the best examples to try to is Movavi Video Editor which is as easy to use as just a simple website and provide you with a lot of functions. Using that tool you can easily edit video clips, images, and audio on a timeline, add a large number of transitions, filters, titles, and callouts, use special effects like Chroma Key and Slo-Mo and export any video in any popular format. Try these web services mentioned above and find the one that suits you best.